In all the discussions about digital disruption at MIPTV this week, one company has loomed large: YouTube. It’s creating brand new stars and entertainment networks, yet is also becoming an important platform for established TV producers and broadcasters. Today, a full Grand Auditorium heard from YouTube’s global head of entertainment Alex Carloss, in a keynote speech titled “The Power of Choice”. In mid-February, when Jimmy Fallon took over from Jay Leno as host of the Late Show. 10m tuned in, but the views on YouTube doubled that: 20m views. “In the first two weeks of his show, his channel generated 90m views on YouTube,” he explained, showing a clip of Kimmel and Justin Timberlake doing their history of rap sketch. Meanwhile, Conan O’Brien has just reached 500m lifetime views on his YouTube channel. Carloss talked about how Ellen DeGeneres uses YouTube. “Her 8.9 million fans are a huge source of inspiration for the show,” he said, before segueing into a video of music/TV mogul Simon Cowell talking about how he sees YouTube’s role in the global success of One Direction, Susan Boyle and other artists – including the sage advice to “never disrespect a cat-lover” about Boyle. He talked about Cowell’s You Generation brand, which lives on YouTube, posing monthly challenges for people to submit their videos in a global competition. “Through You Generation Simon Cowell has made the choice to tap into the second way media is being reshaped: fans become talent,” said Carloss, before moving on to talk about Disney’s movie Frozen, which topped the box-office charts several times in its run. Carloss noted that on average, 60% of views for YouTube creators’ channels come from outside their home countries – and for some popular channels, the percentage is much higher than that. He talked about Psy with the nearly-2bn views of his Gangnam Style video. “I believe Gangnam Style’s legacy is even more impressive,” he said, noting that before its success, the number of views that Korean pop generated was just over 2bn, but now it’s 7bn. 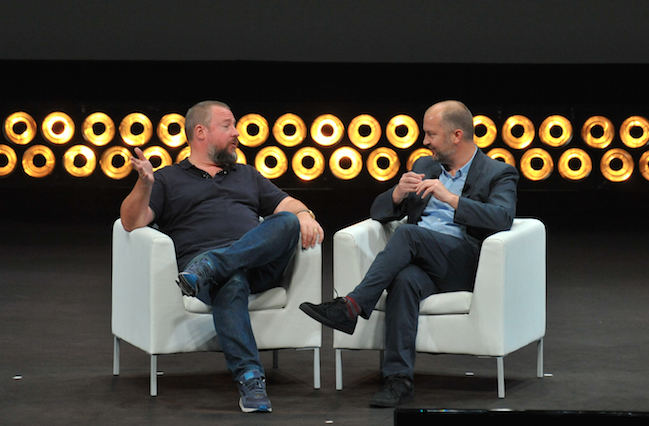 Carloss was joined on-stage at this point by Shane Smith, CEO and co-founder of Vice Media (left), for a sit-down chat about that company’s YouTube-fuelled growth. They started by talking about news, and the conception in the US that “young people aren’t interested in news” according to Smith. “What we found on YouTube, which is the most democratic video-sharing platform in the world, our audience was telling us ‘no, we want news, we want longform, we want documentaries’,” said Smith. “When we started News, we actually asked the audience ‘what do you want?’,” explained Smith, showing a clip of a segment called The People Speak, where young people talked to camera about how they get and want news, and the impact they think the media has. “In three weeks we’ve had 300,000 subscribers and over 20m video views, and we haven’t even started pushing it yet because we didn’t know if it would work. But hey, it’s the power of YouTube,” said Smith, of Vice News. Watch video clips from this and other MIPTV conferences here; full videos on our YouTube channel 2-3 hours after each session ends. More online video innovation tomorrow, with the inaugural MIP Digital Fronts: YouTube and VICE are both presenting original content, as the event’s platform partners. Don’t miss it, in Cannes or here on MIPBlog!